Premium Experience the higher levels of comfort, smaller groups and extra’s. Semi-guided: Daily briefing by the tour leader, independent cycling but tour leader available ICE. 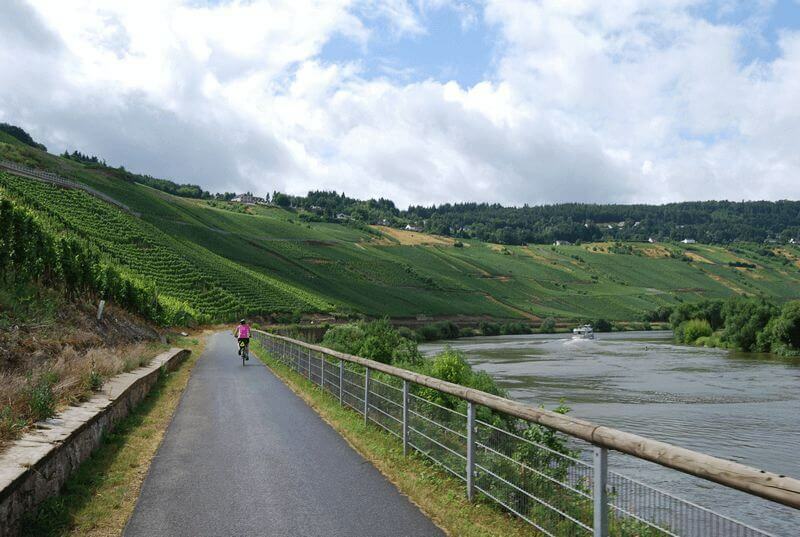 The countryside on both banks of the Moselle is splendid, the cool wines taste deliciously, the picturesque little towns have rich histories and the conditions for cycling are excellent indeed. 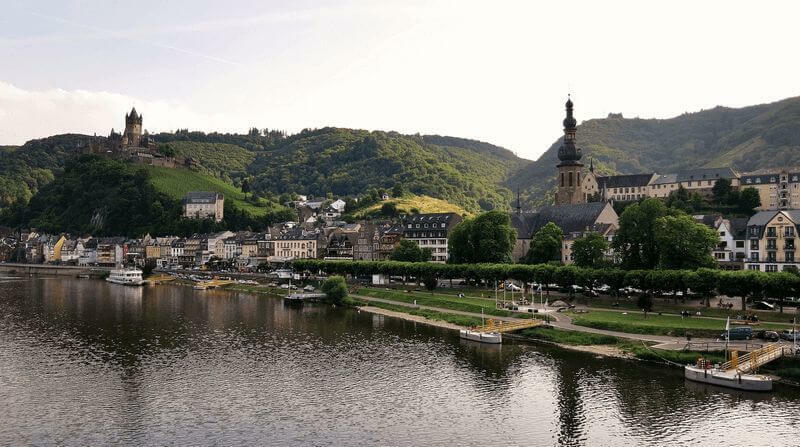 You follow the river Moselle, partly in Germany, partly in France and partly in Luxembourg, along the endless vineyards and the enchanting old cities like Cochem and Bernkastel. It goes without saying that you can taste the local wine as often as you like. Then, of course, there is Trier, once an imperial Roman city. 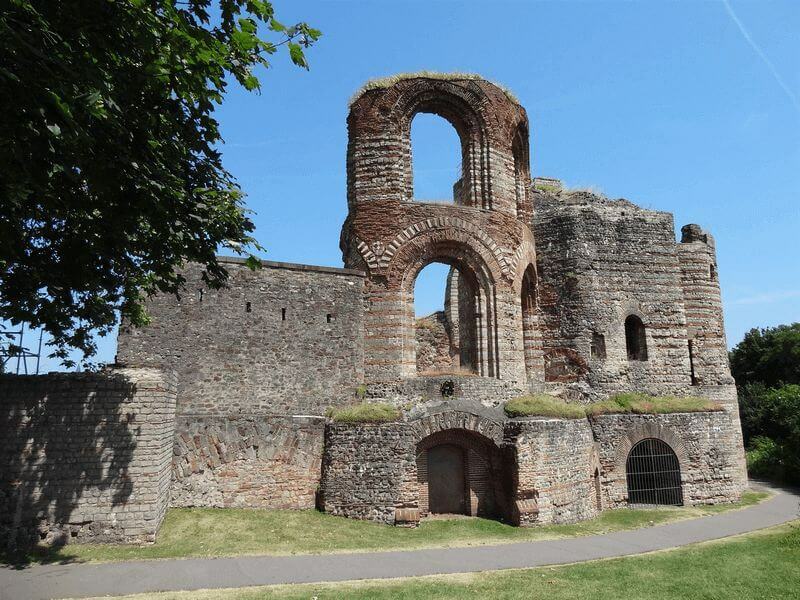 You will see the remnants of this glorious past in Germany’s oldest cathedral, amphitheater, the emperor’s throne hall and famous “black gate,” the remains of the ancient city wall. 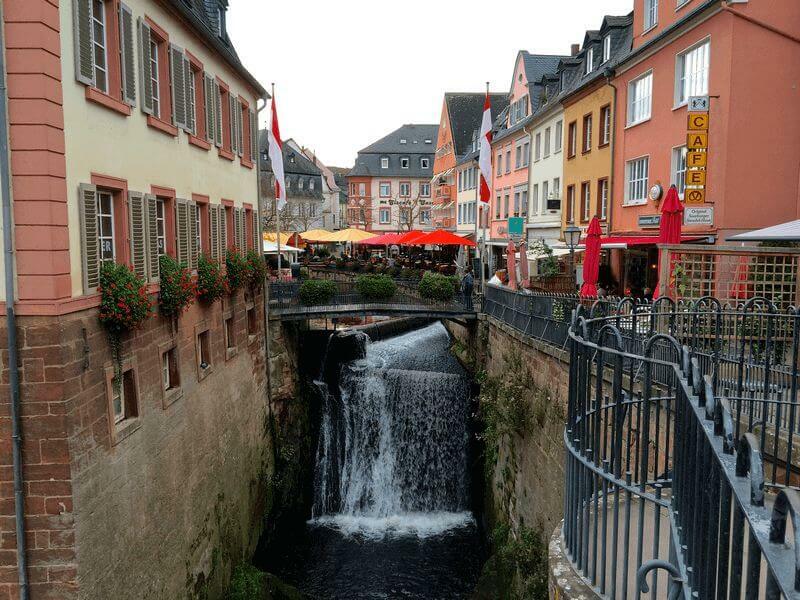 After Trier you will follow the river Saar to visit charming Saarburg, with the stunning waterfalls in the city center. Then onto Luxembourg, the only Grand Duchy in Europe. It’s strategic position between two super powers (France and Germany) made it a contested area to control over the ages. 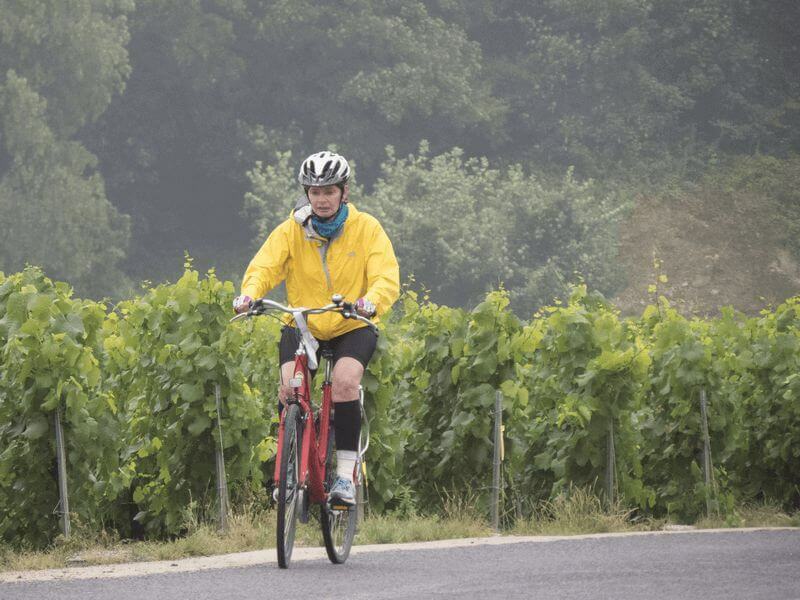 The last day you cycle in France with her welcoming villages, where the inhabitants are proud of their sweet, smooth wines and golden “Mirabellen” liqueur. The tour end in the city of Metz, with her splendid Gothic cathedral. Preparation is half the fun, so why not start straight away? Parts that are printed in italics parts will be covered by the ship. 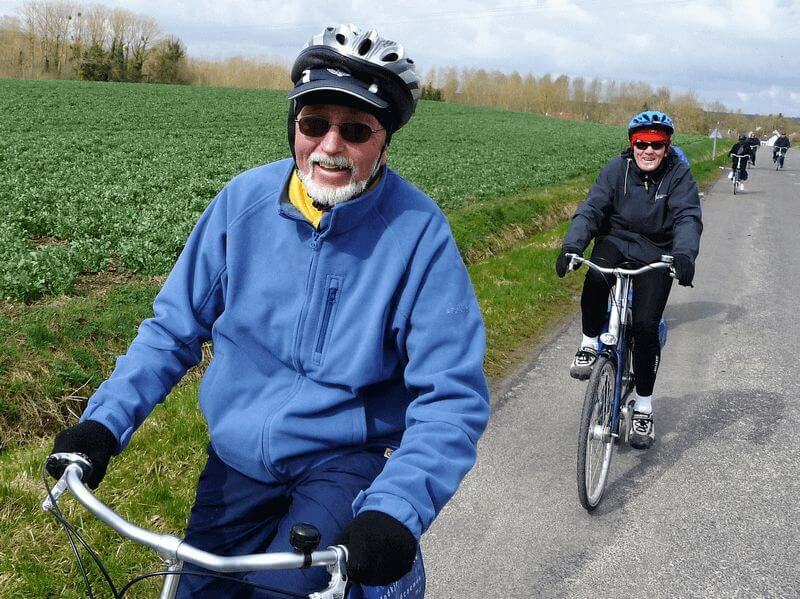 All distances are “approximate distances” of recommended bike tours. The tour details are barring changes, a.o. as a result of nautical, technical or meteorological reasons. Embarkation and check-in is at 2 p.m. in Cochem. 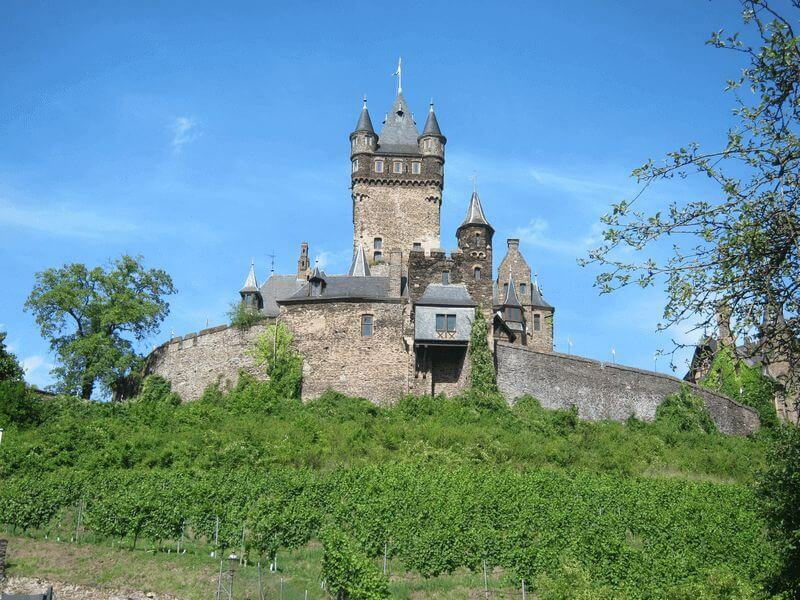 After a welcome meeting with the crew, the tour leader will take you for a walk through this cozy and characteristic Moselle town, with steep wine-clad mountains, wooded hills, an impressive castle and a picturesque square with beautiful timber-framed houses and cafes. You can visit the castle or have a glass of local wine. 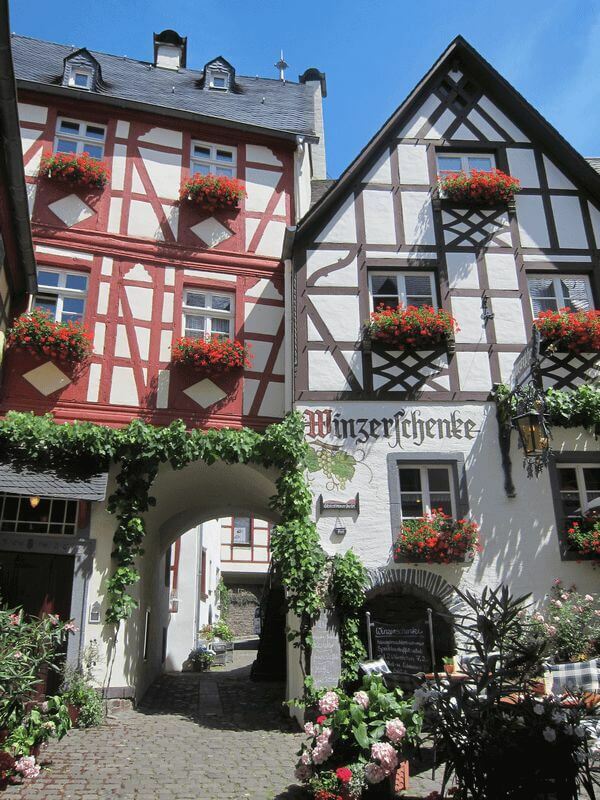 During breakfast the ship will sail to a beautiful little place called Beilstein. There you will have the chance to see the Black Madonna in the chapel of the Carmelite Monastery high on the hill. 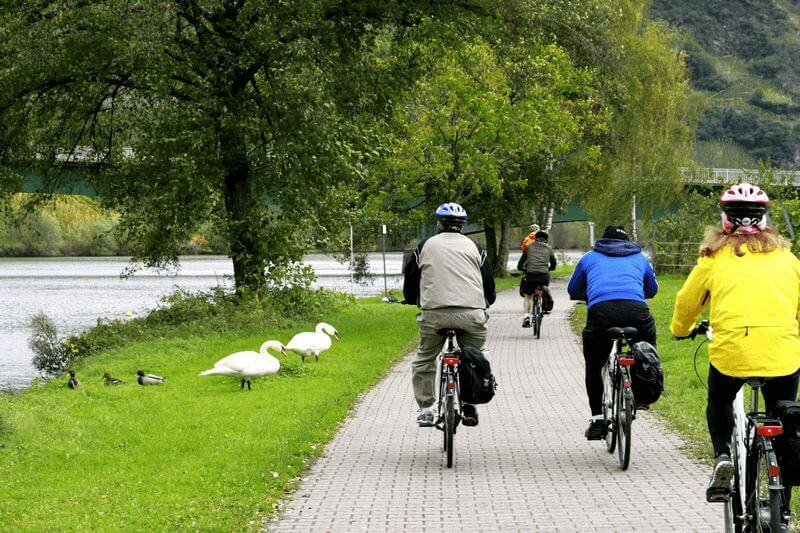 Your first cycling day follows the Moselle upstream to Zell. The ship makes a short stop here, so if you want you can already board and continue the cruising way. 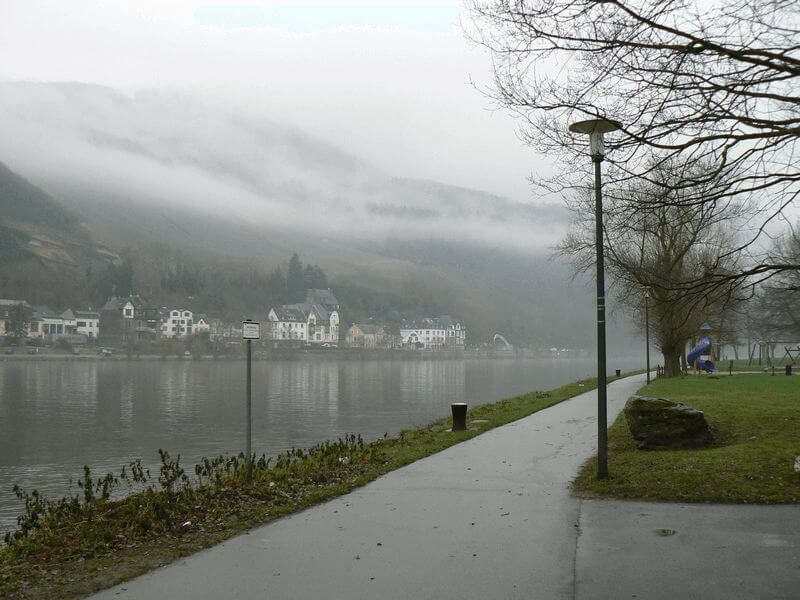 Zell is beautifully situated on the Moselle, where the river meanders through the hills in many loops. Zeller Schwarze Katz (black cat) is a legendary Moselle Wine. You continue to Traben-Trarbach. This little town features world-class Art Nouveau architecture that proves its great importance in international wine trade during the 19th century. 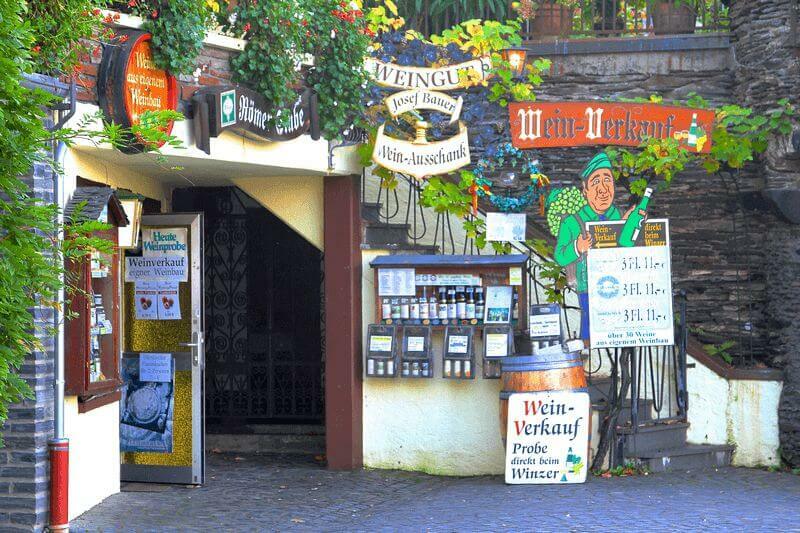 From Traben you sail to Bernkastel-Kues, This frequently visited, old and picturesque town produces the best wines of the Mid-Moselle. 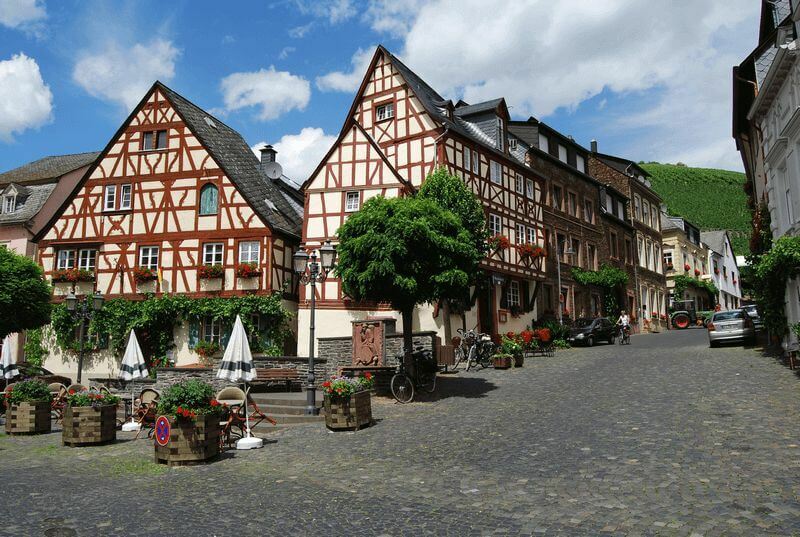 Pride of the town is the market square, with its picturesque timber-framed houses. A walk to the castle offers a beautiful view. This morning you leave the river and vineyards behind. You will be shuttled by bus up into the Eifel region to the city of Daun. 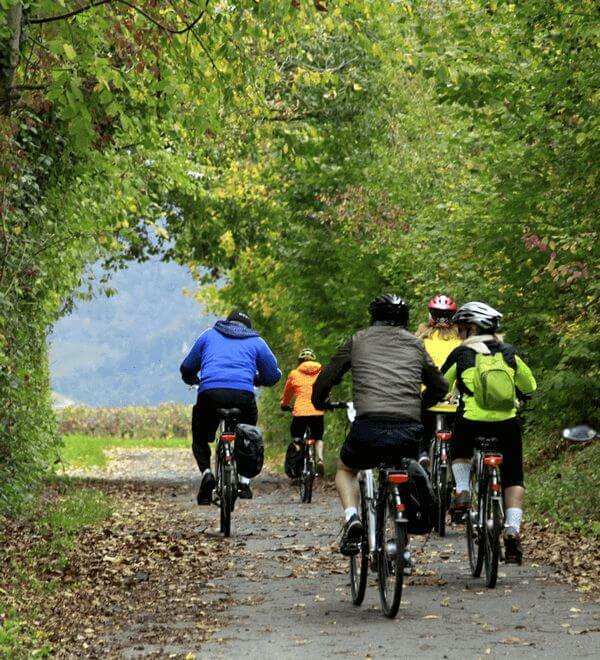 From there, we take an exhilarating bicycle ride along a former railway track that is now a cycling path. The ride includes stretches through tunnels, over bridges and by small lakes formed from volcano craters, known as maars. After the last tunnel we have a break in a local little town were you will love to have an ice-cream on the terraces, well deserved! 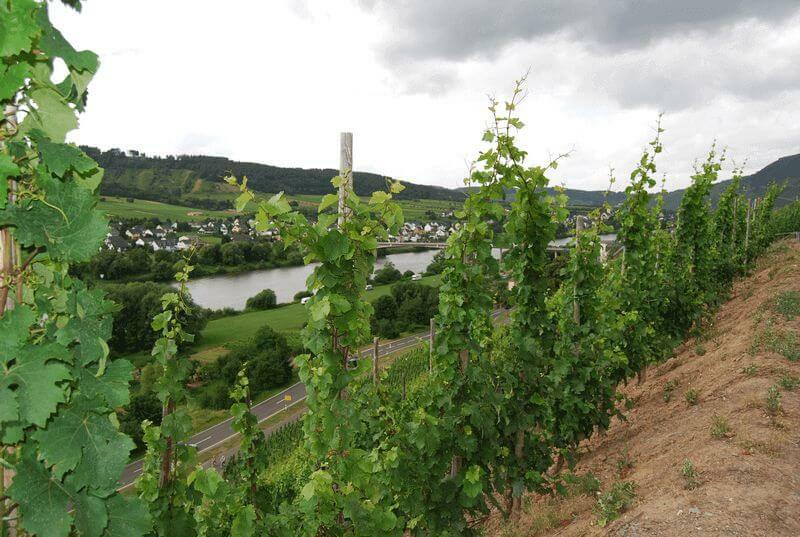 From Bernkastel, the valley opens up and vineyards expand as far as the eye can see. Today we cruise past the heavy-hitters in the wine world: Brauneberg, Piesport, Trittenheim. Piesport is beloved by the Brits for the “little golden droplets.” Trittenheim lies in a sharp hairpin turn on the river surrounded by mountains coated with grapes. 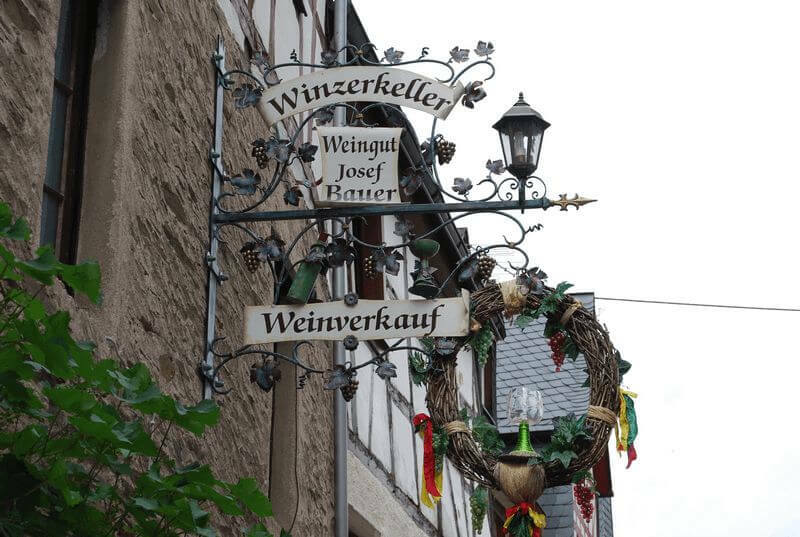 Around lunchtime you will arrive in Neumagen, already in Roman times an important center of wine production. You can decide to join the barge from here or continue by bicycle to Schweich, where again the barge will be waiting for you. Once on board you will cruise to Trier, the oldest city in Germany. Trier was founded around 15 before Christ by Caesar Augustus under the name of Augusta Trevorum. As a trading town and administrative center, Trier flourished during the late imperial age. This Roman golden age has left us with a respectable number of monuments. Most authentic is the city gate Porta Nigra, which was built around 18 after Christ. 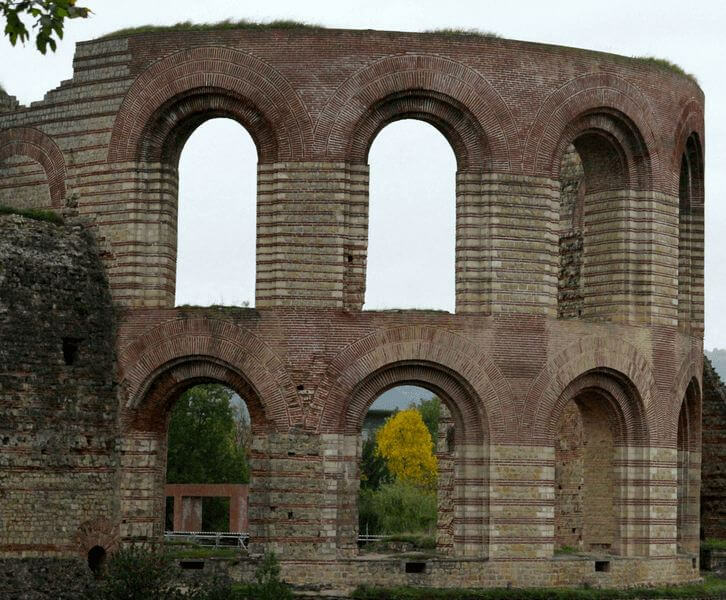 In the morning your tour leader will take you into Trier and walk you around in Roman history. There is also time to discover and enjoy Trier on your own. 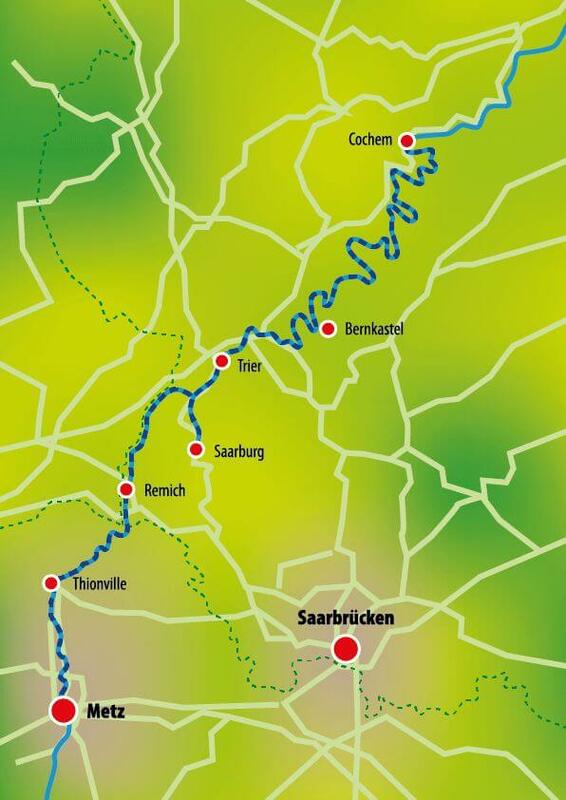 After lunch you will hop on your bicycles and follow the Mosel and Saar river to our next destination, Saarburg. 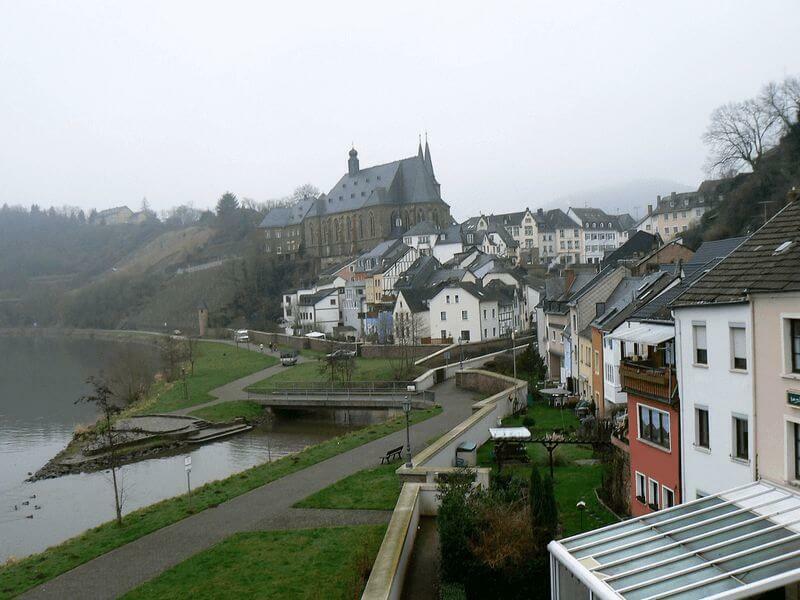 Saarburg is an interesting old town situated in the most beautiful part of the Saar valley. Here the banks of the river are densely forested. The castle of Saarburg was built here in the middle of the 10th century. In the middle of town you come across a waterfall of 20 meters high. At the foot of this waterfall there is an old mill, which is driven by the small river. In this part of town most of the old houses from the 17th and 18th century, which give Saarburg such a picturesque look, are still intact. Today there is no dinner on board. 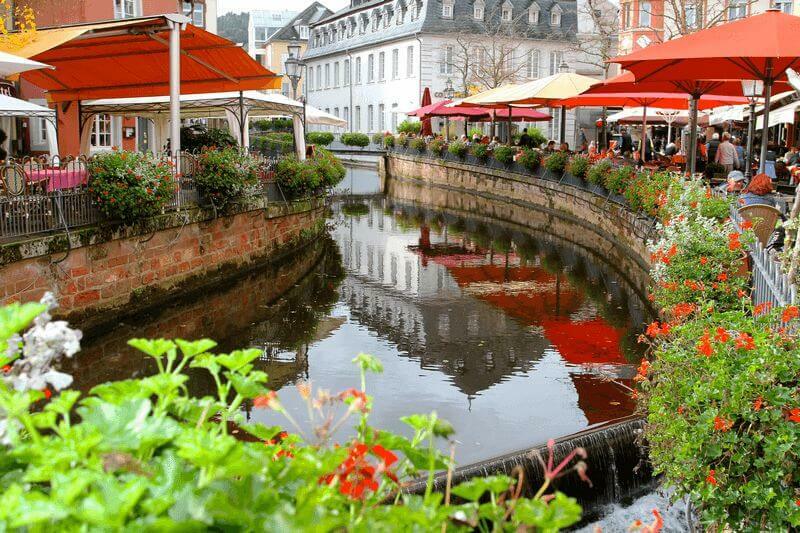 You can select one of the local restaurants of Saarburg. Today there are 2 cycling options. One is easy, but a bit longer along the rivers. The shorter option is a bit more challenging, through the hills. Whatever your choice is, the cycling will lead you into the Grand Duchy Luxembourg. Here the Moselle forms the border between Germany and Luxembourg. Luxembourg is a small country, but her capital (also called Luxembourg) is an important finance center and EU administrative city. On the way, at the Luxembourg side, we visit a wine cooperative, specialized in the so called “Cremant”, say the Champagne of the Moselle. 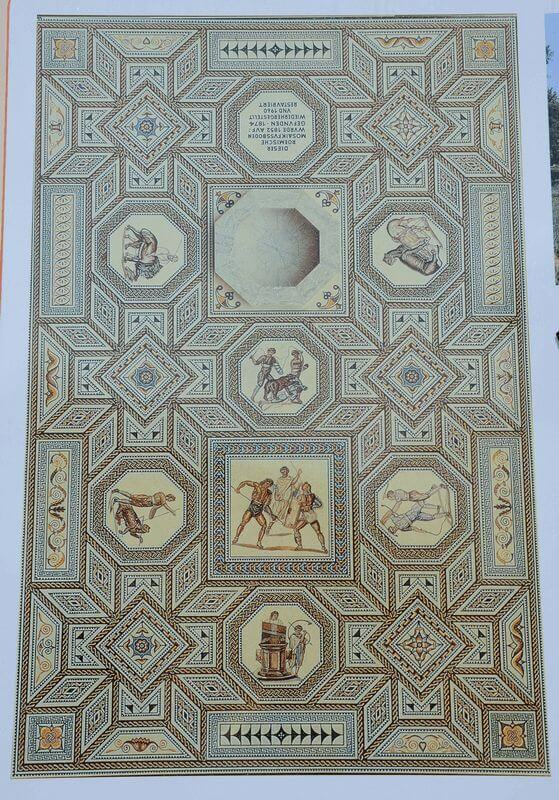 Close to Remich you can admire a Roman mosaic floor. The tile floor which lies in its original place, was once the centerpiece in a palatial Roman villa. The scene (in 3 million individual tile pieces) reveals scenes from gladiator games in the amphitheater. 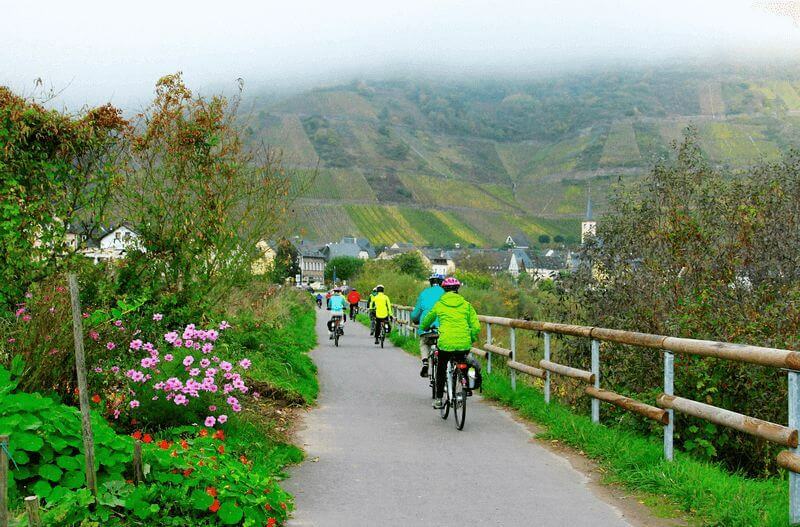 While having breakfast you will cruise to Schengen, where your cycling tour will start. The “Schengen agreement” is something everybody in Europe has heard of, whereas almost nobody knows that it is named after this little town in Luxembourg at the 3-country border. Soon we will cross the Luxembourg- French border and experience the outcome of this agreement: no border controls. 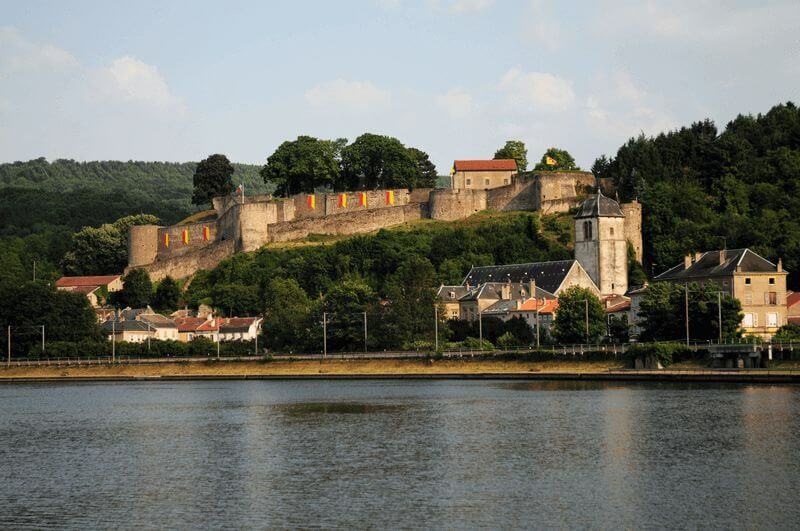 We pass the fortress of Sierck-les-Bains, one of the palaces inhabited by the powerful Dukes of Lorraine. 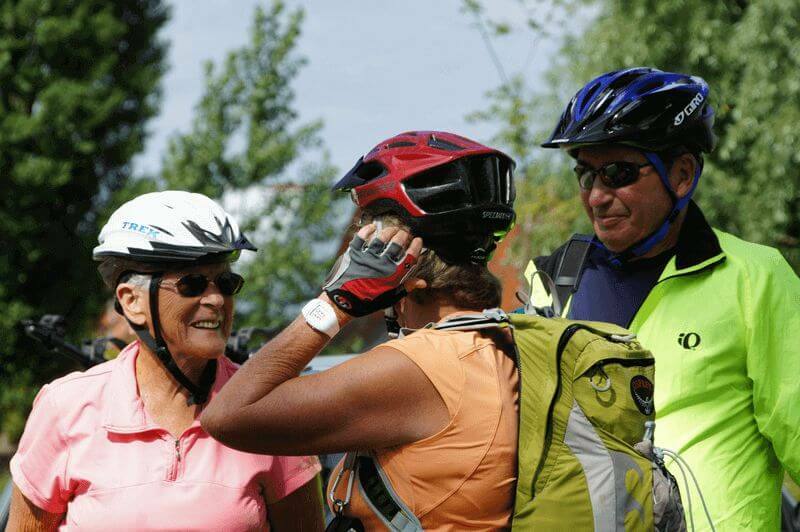 The route is lovely through French countryside, and friendly villages. Around lunchtime you will arrive in Thionville, the center of the steel industry until the 1980s. That might sound modern and industrial, but the city is ancient. The historic center shows us the medieval ramparts, lovely gardens, old streets and St.Maximin basilica. Here the ship is waiting to pick you up to cruise to Metz, another ancient city strategically situated on a Roman trading route. St.Etienne Cathedral is the 3rd largest gothic church in France with flying buttresses and Marc Chagall stained glass windows. Metz is full of stunning architecture, flowers and great cafes. End of tour. Disembarkation after breakfast, till 9:30 a.m.
With 18 guests or more, the daily cycling tours will be accompanied by two knowledgeable and multi-lingual tour leaders. On most days, the tour leaders will offer a long and a short (or a quicker and a more relaxed) cycling option. The option for a long tour is also depending on weather conditions and wishes of the group. When there are less than 18 guests aboard, the tours will be accompanied by one knowledgeable and multi-lingual tour leader. 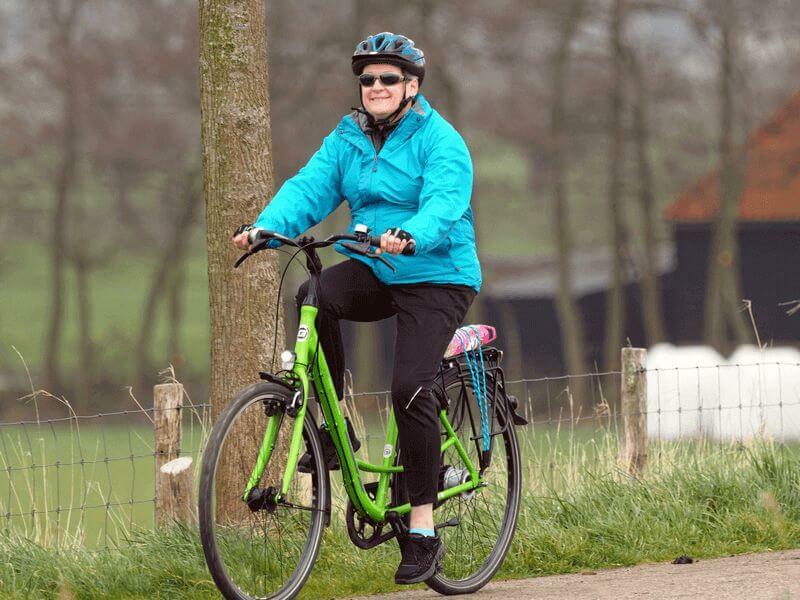 During days when two bicycle options are possible, the tour leader will make a choice to guide the longer or the shorter option after consultation of the group. Not all mentioned highlights can be visited during the short cycling option. You can also choose to ride individually with the help of a map (available on board). GPS tracks will be sent to you 4 weeks before the start date of the tour. In case you prefer a day of rest, you can skip the bicycle tour and relax on board while cruising to the next town. On the arrival day is it possible to bring your luggage on board from 11 a.m.
Legal notice: Boat Bike Tours is not the organizing operator, but the travel agent for this tour; this is a so called ‘partner tour’. Tour operator is : Vof Hanzecharter. Embarkation and check-in is at 2 p.m. in Metz. After a welcome meeting with the crew there is time for bicycle fitting and a little test ride. After dinner your tour leader will take you for a walk through Metz. Metz is a beautiful old city strategically situated on a Roman trading route. St. Etienne Cathedral is the 3rd largest gothic church in France with flying buttresses and Marc Chagall stained glass windows. Metz is full of stunning architecture, flowers and great cafes. We advise you to come to Metz one or more days earlier, so that you will have plenty of time to discover this interesting city. While having breakfast you will cruise in the direction of Thionville. Close to this town your bicycle tour starts. Thionville, once was the center of the French steel industry. That might sound modern and industrial, but the city is ancient. The historic center shows you the medieval ramparts, lovely gardens, old streets and St.Maximin basilica. The route is lovely through French countryside, and friendly villages. You pass the fortress of Sierck-les-Bains, one of the palaces inhabited by the powerful Dukes of Lorraine. 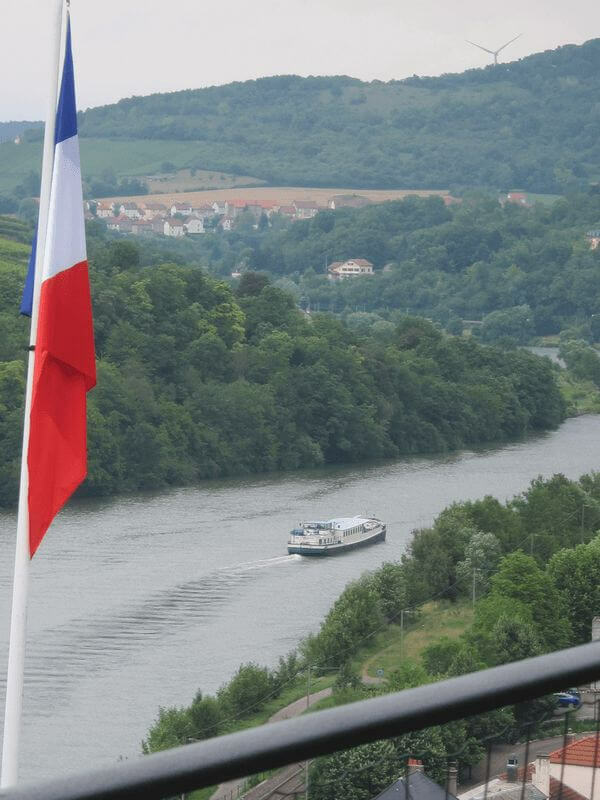 Via the valley of the Moselle you cross the French-Luxembourg border at Schengen. The “Schengen agreement” is something everybody in Europe has heard of, whereas almost nobody knows that it is named after this little town in Luxembourg at the 3-country border. At crossing the Luxembourg- French border we experienced the outcome of this agreement: no border controls. Close to your final destination Remich you will visit the small village of Nennig, stop at what once was an old roman villa. 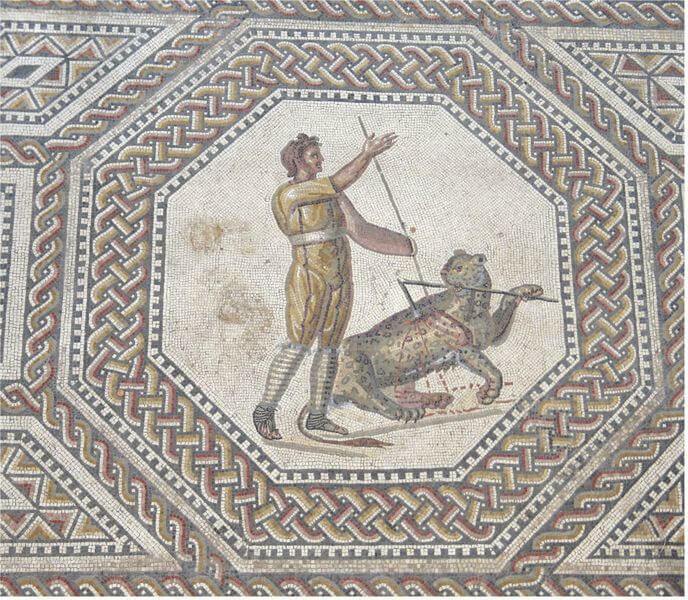 A tile floor which lies in its original place, was once the centerpiece in this Roman villa. The scene (in 3 million individual tile pieces) reveals scenes from gladiator games in the amphitheater. The river Moselle is here the border between Germany and Luxembourg. You start following the river on the German side, but soon you will hop to the Luxembourg side. There you’ll visit a wine cooperative, specialized in the so called “Cremant”, say the Champagne of the Moselle. 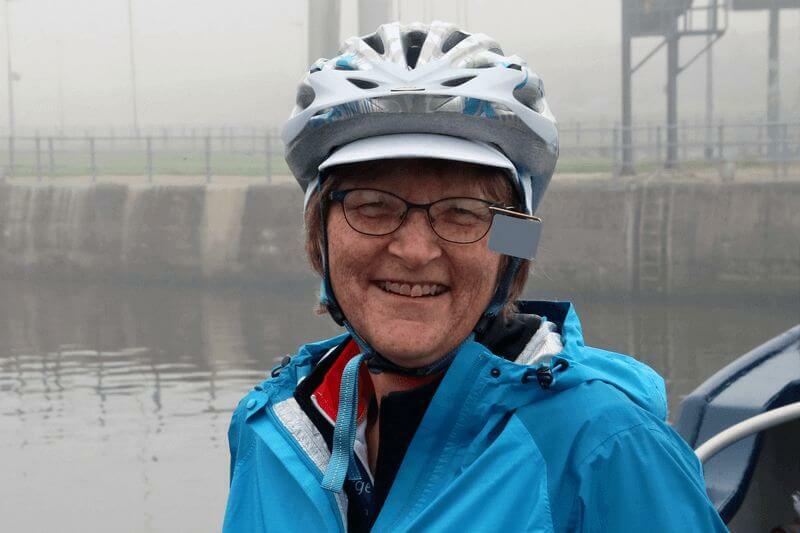 Then there are 2 cycling options: One is easy, but a bit longer along the rivers. The shorter option is a bit more challenging, through the hills. 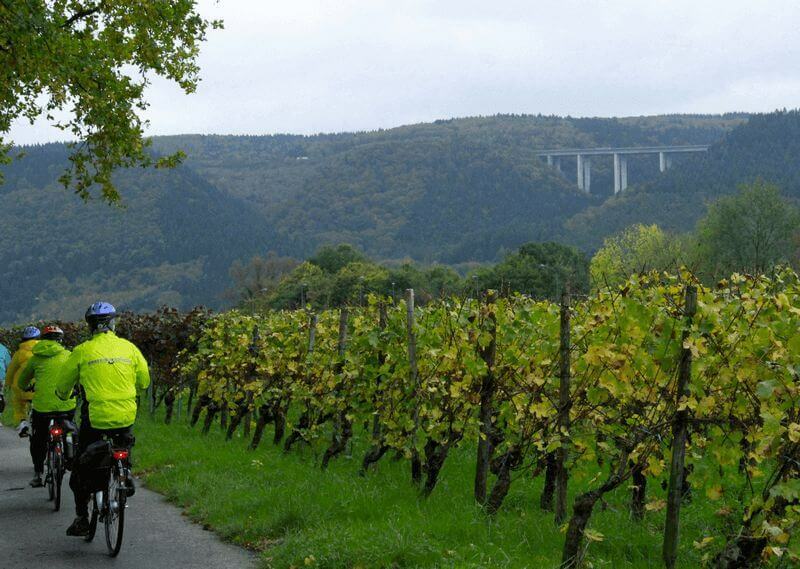 Whatever your choice is, the biking will lead you to your Saarburg, an interesting old town situated in the most beautiful part of the Saar valley. Here the banks of the river are densely forested. The castle of Saarburg was built here in the middle of the 10th century. In the middle of town you come across a waterfall of 20 meters high. At the foot of this waterfall there is an old mill, which is driven by the small river. In this part of town most of the old houses from the 17th and 18th century, which give Saarburg such a picturesque look, are still intact. 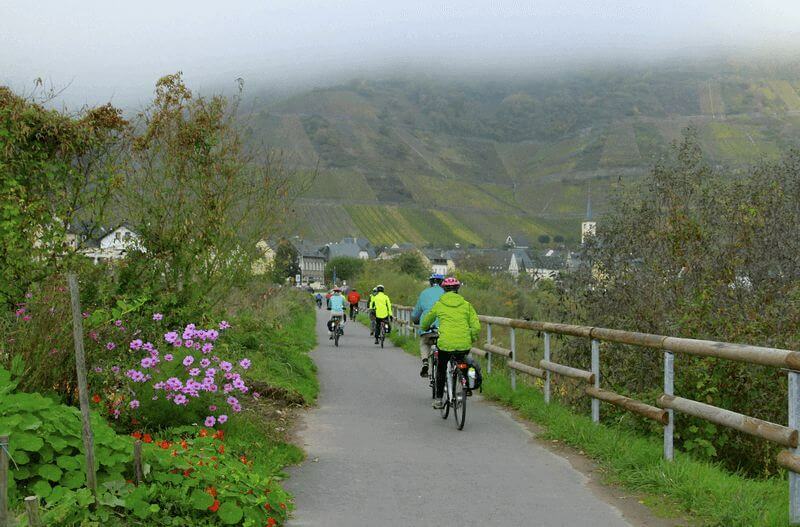 After breakfast your tour leader will take you for a short bicycle tour to Trier. You will arrive there around lunchtime. After a guided walk there is time to discover and enjoy Trier on your own. Trier is known as the oldest city in Germany. The city was founded around 15 before Christ by Caesar Augustus under the name of Augusta Trevorum. As a trading town and administrative center, Trier flourished during the late imperial age. This Roman golden age has left us with a respectable number of monuments. Most authentic is the city gate Porta Nigra, which was built around 18 after Christ. Today there is no dinner on board. You can select one of the local restaurants of Trier. 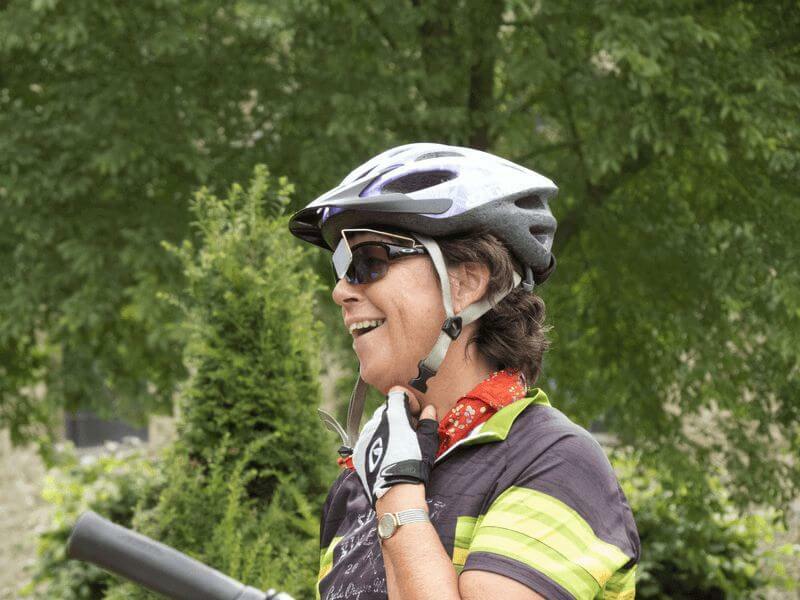 After a breakfast cruise you will start your bicycle tour in Schweich. You have now entered the “The Romantic Moselle”, the unofficial name for the mid- Moselle. Lovely vineyards expand as far as the eye can see. You cruise past the heavy-hitters in the wine world: Trittenheim and Piesport. Trittenheim lies in a sharp hairpin turn on the river surrounded by mountains coated with grapes. Piesport is beloved by the Brits for the “little golden droplets.” Around lunchtime you will arrive in Neumagen, already in Roman times an important center of wine production. You can decide to join the barge from here or continue by bicycle to Bernkastel-Kues. 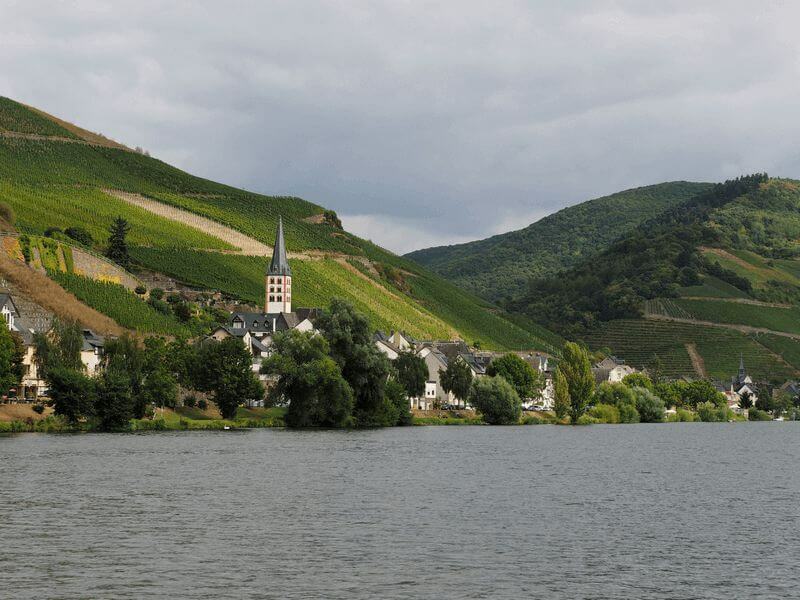 This frequently visited, old and picturesque town produces the best wines of the Mid-Moselle. Pride of the town is the market square, with its picturesque timber-framed houses. A walk to the castle offers a beautiful view. This morning you leave the river and vineyards behind. You will be shuttled by bus up into the Eifel region to the city of Daun. 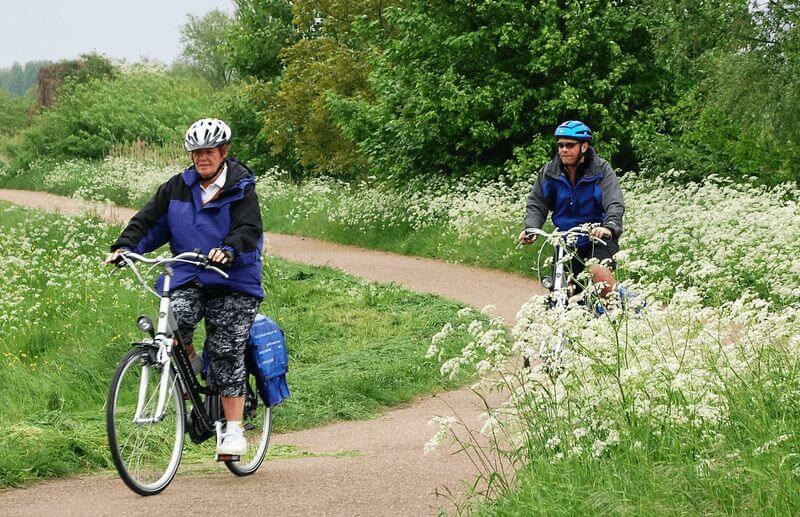 From there, we take an exhilarating bicycle ride along a former railway track that is now a cycling path. The ride includes stretches through tunnels, over bridges and by small lakes formed from volcano craters, known as maars. After the last tunnel you can have a break in a local little town were you will love to have an ice-cream on the terraces, well deserved! During breakfast the ship brings you to Traben-Trarbach. This little town features world-class Art Nouveau architecture that proves its great importance in international wine trade during the 19th century. 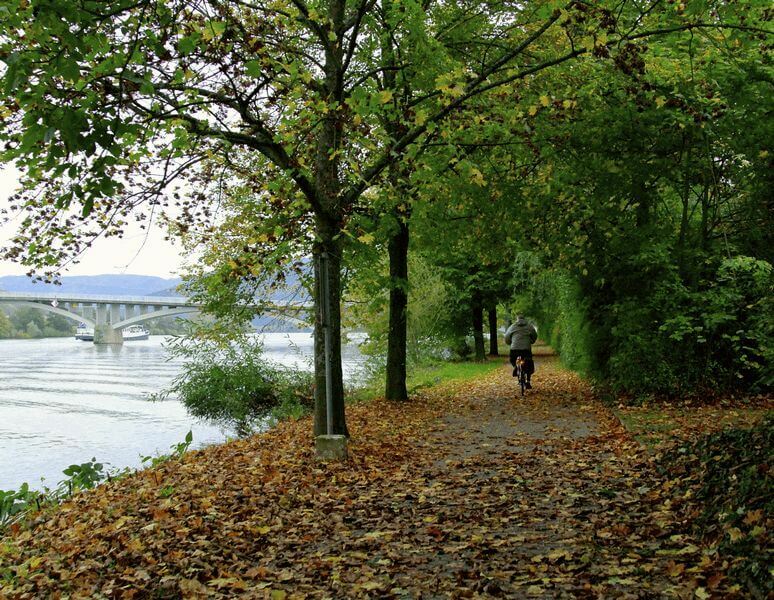 You can also start biking a little later from Zell, beautifully situated on the Moselle, where the river meanders through the hills in many loops. Zeller Schwarze Katz (black cat) is a legendary Moselle Wine. Last stop before Cochem is Beilstein. 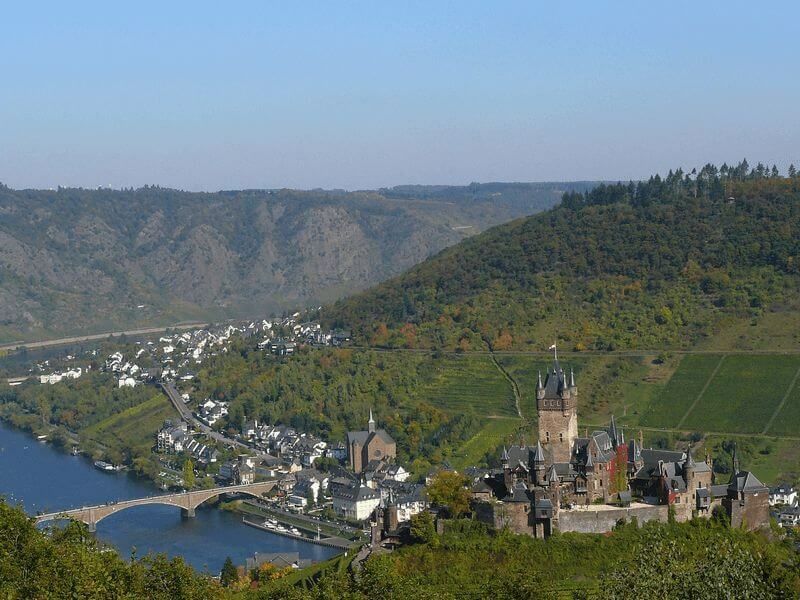 This beautiful little place is sometimes referred to as the ‘pearl of the Moselle’. Then onto your final destination Cochem, a cozy and characteristic Moselle town, with steep wine-clad mountains, wooded hills, an impressive castle and a picturesque square with beautiful timber-framed houses and cafes. A perfect place for a glass of local wine. Below you see an overview of the available (blue) dates; the yellow dot means that this date has 2 or less cabins available, orange is ‘on request’ and red means that on this date there aren’t any cabins available. Then click on the preferred date. After this, choose your ship (some tours have only one ship, and therefore there is no choice), the number of cabins in the required (and available) category, any desired additional products, and ‘local costs’ (such as special dietary needs, which you usually pay for onboard). On the right side, you’ll find the ‘Booking Summary.’ After completing your preferences and necessary information click ‘Book now’ to finalize your booking. Single cabin is on request available. Reiseveranstalter sind nach geltendem Europäischen Recht dazu verpflichtet, erhaltene Kundengelder für den Fall eigener Zahlungsunfähigkeit oder Insolvenz abzusichern. Boat Bike Tours (Handelsregisternummer 3714 7084) ist ein in den Niederlanden unter Nummer 3734 registrierter Teilnehmer von SGR (Stichting Garantiefonds Reisgelden). Diese Registrierung ist auf www.sgr.nl überprüfbar. Die teilnehmenden Reiseveranstalter unterliegen dem in den Niederlanden gesetzlich vorgeschriebenen Garantieschutz des SGR Insolvenz-Garantiesystems. Gemäß der Garantieleistung von SGR werden dem Endverbraucher die im Voraus bezahlten Reisesummen erstattet, wenn der Reiseveranstalter finanziell nicht in der Lage ist, seine vertraglichen Verpflichtungen zu erfüllen. Sofern die Vereinbarung Transport beinhaltet und das Ziel bereits erreicht ist, wird die Rückreise arrangiert. Boat Bike Tours hat die vom Gesetzgeber vorgeschriebene Insolvenzversicherung für Endverbraucher, deren Wohnsitz in Deutschland ist, über die tourVERS, eines in Deutschland führenden Anbieters, abgeschlossen. Über 1.200 Veranstalter aller Größenordnungen und touristischen Bereiche sind über tourVERS versichert. Auf der Internetseite der tourVERS finden Sie alle Informationen zur Insolvenzabsicherung. Endverbraucher, die in Deutschland bewohnhaftet sind, erhalten bei Buchung bei Boat Bike Tours mit der Buchungsbestätigung auch den Sicherungsschein von tourVERS. Hinweis: Die o.g. deutsche Übersetzung des Abschnitts über SGR ist keine offizielle SGR-Übersetzung. SGR kommuniziert nur auf Niederländisch und Englisch. Der niederländische Text zum SGR-Garantiesystem ist allgemeinverbindlich. Please click on Ship for a description of the bicycles. Between Cochem and Metz, there is a good train connection. Please visit one of the following websites for timetables, tickets or more information www.goeuro.co.uk or www.trainline.eu. Legal notice: Boat Bike Tours is not the organizing operator, but the travel agent for this tour; this is a so called ‘partner tour’, available on request. Tour operator for the tour on the Quo Vadis is: Vof Hanzecharter, Eelderwolde, Netherlands and the tour operator for the tour on the Iris is MPS Iris BV. Your home away from home is the comfortably furnished and cozy Quo Vadis. This barge is equipped with 12 spacious cabins, all with private bathroom, two single beds (that can be pushed together as a double) and air conditioning. In the delightful open salon with comfy seats, a restaurant area and small bar is the place to be before and after your bike ride. Or, when the weather is fine enough, outside on the covered sun deck. Perfect for enjoying a drink or a tasty and healthy dinner. Who can and likes to play, there is a guitar and piano on board. Live music whenever you feel like it! Bicycles on board are unisex Hybrid Bikes of the German brand VSF FahrradManufaktur with low entry, 8-gears, handbrakes and pannier bag. E-Bikes of the brand Kreidler Vitality 3 with 7-gear and 5 support levels, handbrakes and pannier bag. 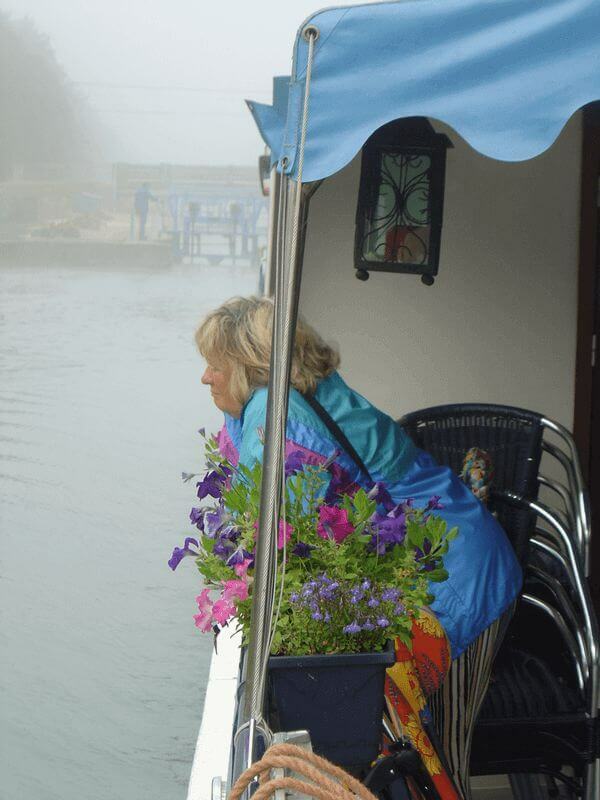 Right when you step on board of this charming ship, you will feel that the proud owner and hostess and her crew are committed to give you a wonderful stay. The Iris has 12 spacious twin cabins with a private bathroom, a wardrobe with a mini-safe, central heating and air-conditioning – all on the lower deck. On the main deck there is a stylish sitting area with a TV, a bar for your tasty drinks and a restaurant section, where each morning you will enjoy your healthy biker’s breakfast and a delicious three course dinner in the evening. Receive new tours and travelling inspiration directly into your inbox Curated by our travelling agents and highly trained and experienced guides, just for you. © All information may be subject to later changes and may contain typographical or graphical errors; your travel confirmation is binding. Our general conditions (www.boatbiketours.com/terms_and_conditions) apply to all tours, programs and travel confirmations. Texts and images: Boat Bike Tours Ltd. Images: several organisations such as Visit Gent, Paris Tourist Office, Hanzesteden Marketing, Holland.com, and photographers such as Jan DHondt, Daniel Thierry, Marc Bertrand and Ellen Haars. This website is owned by Boat Bike Tours B.V. Please enter a number from 1 to 150. Please enter a number from 1 to 60. Our 6-part email course will walk you through everything you need to know about planning—and enjoying!—a European tour by boat and bike.